Third revised edition, loaded September October 4, 2013. S'rî S'uka said: 'The Supreme Lord staying there [in Vraja] in the company of Baladeva, saw how the gopas were busily engaged in arranging a sacrifice for Lord Indra. 'Tell Me dear father, what is all this goings-on of you about? Where does it lead to, for whom is it done and what are the means by which this sacrifice is accomplished? Please tell Me about it. I have this great desire to hear about it, oh father. Surely it cannot be so that the activities of saintly men who are equal towards everyone in this world, indifferent about mine and thine, and neutral towards friends and foes, are something to be secretive about, is it? A stranger one may avoid like he is an enemy, but a friend one should treat like oneself so they say. When common people do something in the world they sometimes engage with knowledge and sometimes they engage without. Engaging with expertise one achieves an optimal result and with ignorant actions that is not the case. S'rî Nanda said: 'Indra is the great lord of the rain and the clouds are his personal representatives. They provide the rain for all living beings. Rain is the gratifying life force, just like milk. Because of the liquid discharged by this lord and master of the clouds my dear son, we and also other people worship him with fire sacrifices and various paraphernalia. With the remnants of those sacrifices people sustain their lives in three different ways [religiously, economically and sensually]. He is the superhuman being who brings the fruits to those who with their human actions are motivated for a certain yield [like farmers]. S'rî S'uka said: 'After having heard Nanda's words and also what the other residents of Vraja had to say, Lord Kes'ava spoke to His father in a way that made Lord Indra very angry. The Supreme Lord said: 'It is because of karma that a living entity takes birth and it is by [the force of] his karma alone that he meets his demise. Happiness or unhappiness, security and fear are all the result of one's karma. If there would be some controller giving shape to the fruit of the activities performed by others, then that ruler still depends on someone who engages in action. He can after all not be the master of someone who does nothing! Living beings have to face the consequences of their own actions, what have they to do with Indra who is incapable of altering that what is ordained by anyone's personal nature? A person is controlled by his nature - he follows his nature. This entire world with its gods, demons and common men exists on the basis of everyone's personal nature. Living beings as a consequence of their actions obtain and forsake higher and lower evolved bodies. Karma alone is their enemy, friend and impartial judge, their Lord and their teacher [see also B.G. 8: 15 & 16, 4.29: 26-27 and 7.7: 46-47]. One should therefore, keeping to one's duties, exercise respect for the karma of one's own nature [see varnâs'rama]. One lives rightly by that karma, it is no doubt someone's worshipable deity. The way an unfaithful woman with her lover does not gain any real benefit from resorting to another living being, it is also not to someone's advantage to prefer a thing [or deity] different from the one that is one's livelihood. The brâhmanas maintain their life [by teaching and explaining] the Vedas, the kshatriyas by protecting the land, the vaishyas by trading and the s'ûdras by serving the twice-born ones [the former three, see also 7.11: 21-24]. The fourfold occupational duty of the vaishya consists of farming, trading, cow protection and banking as the fourth. Among these the constant care for the cows is the duty we are engaged in. [The natural qualities of] goodness, passion and ignorance are the cause of the maintenance, creation and destruction [in the world. See guna]. From the mode of passion this universe is generated and from its mutual [sexual] action we find the [biological] diversity of this world. The clouds impelled by that passion pour down their water everywhere and by that water they factually maintain the population. So what would Indra then do? The cities, the cultivated lands and the villages are not the places where we are at home. We are the forest people dear father, we always live in the forests and the hills. Let us therefore begin with a sacrifice for the cows, the brahmins and the hill [Govardhana] and use for this worship the paraphernalia of Indra's sacrifice [see also footnote 10.8*3]! Let us cook all sorts of preparations and soups, beginning with sweet rice, porridge, buns and cakes and let us use all kinds of dairy products. Let there be properly prayed before the fires by brahmins versed in the Vedas whom you should feed with well prepared dishes and reward with cows and other gifts. To act appropriately in respect of everyone, also should be thought of others: fallen souls like dogs and outcasts. After next having given grass to the cows the offerings should be presented to the mountain. After having eaten our fill, we in our best clothes, being smeared with sandalwood pulp and nicely adorned, should circumambulate the cows, the brahmins, the fires and the hill [always kept to the right]. S'rî S'uka said: 'When Nanda and the elders heard these words being spoken by the Supreme Lord, by the Time in person in order to break the pride of Indra, they accepted them as excellent. And so they executed everything Madhusûdana had spoken about: they arranged for the auspicious recitations, they all together respectfully paid tribute to the hill and the brahmins with the paraphernalia mentioned, they offered grass to the cows, the bulls and the calves and next they circumambulated the hill with the animals in front of them. The cowherd women nicely ornamented and riding wagons that were yoked with oxen, sang the glories of S'rî Krishna while the twice-born ones chanted their benedictions. To instill faith in the gopas, Krishna thereupon assumed another form. Saying 'I am the hill' He devoured the abundance of offerings with the immensity of His body [see vapu and footnote *]. *: S'rîla Prabhupâda writes to this (Krishnabook ch. 24): "The identity of Krishna and Govardhana Hill is still honored, and great devotees take rocks from Govardhana Hill and worship them exactly as they worship the Deity of Krishna in the temples. Devotees therefore collect small rocks or pebbles from Govardhana Hill and worship them at home, because this worship is as good as Deity worship." 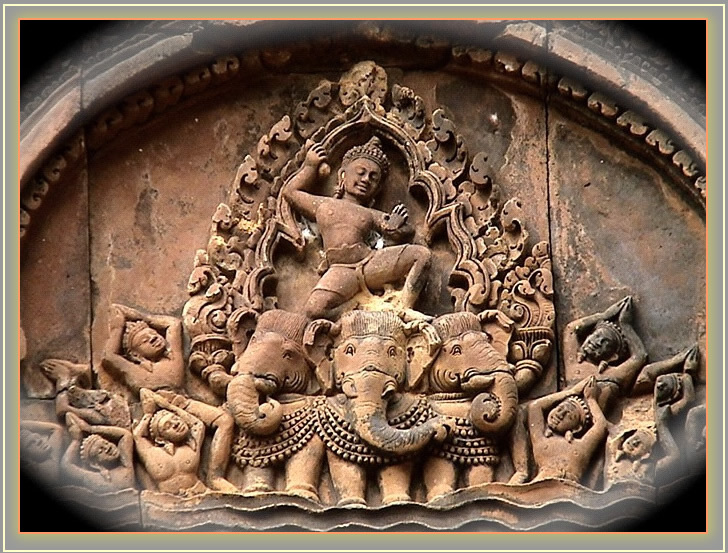 The picture of Indra worshiped is a detail of a temple relief in Banteay Srei, Cambodia. Source.